Our hook and line Albacore fishery is now certified as eco-friendly by the Marine Stewardship Council (www.msc.org) via the American Albacore Fishing Association. (www.americanalbacore.com)! A troller fishes for albacore tuna, as for salmon, by towing a number of lures, or baited hooks, through the water. Albacore trollers tow artificial lures on the surface at faster speeds (from four to eight knots) than those used for salmon, to catch fast-moving, hard-hitting tuna. Action can be fast and furious, with fishermen pulling in fish as fast as they can. A day's catch can range from nothing to several hundred fish. A good day's catch might be 300 tuna, with individual fish weighing up to 30 pounds. Albacore trollers, called jig boats, tow 10 to 20 lines of varying lengths from the outriggers and stern. A lure (jig) is attached to the end of each unweighted line. Jigs have metal heads, plastic skirts or feathers, and large barbless hooks and are shaped to look like squid. There is a cord attached to each line, called a tag line. The tag line is used to pull the fishing line within reach, where a mechanical reel is then used to bring the fish the rest of the way in. Each fish is landed by Tuna jig hand, unhooked, and then bled and prepared for icing or freezing. Albacore boats are from 38 to 100 feet long and have a crew of two to three fishermen. The larger vessels can range hundreds of miles offshore, and a trip can last a month or more. The catch on these vessels is fresh frozen at sea. Albacore usually arrive in the summer with the warm current from Japan and leave in the fall, but water conditions influence whether and when they appear off the Oregon coast. Albacore prefer a water temperature of 58 to 64 degrees, and virtually no other fish are caught as bycatch when fishermen troll at this temperature range. Fish caught for the major canneries are not bled as are fish targeted for local fresh markets. The albacore harvested by Oregon fisher-men are younger fish (three to five years old) between 10 and 30 pounds and are higher in omega-3 fish oils than the large, lean, older albacore caught by foreign longline fishermen in the central Pacific. Because these fish are young, mercury accumulation is not a concern. As a result they taste better and are more healthful. Some fishermen sell albacore fresh on the dock. In local custom-canning operations, fresh albacore are placed raw in the can and then cooked in their own juices, retaining the healthful fish oils and taste. Industrial canneries precook the fish before canning, losing some taste and fish oils in the process. 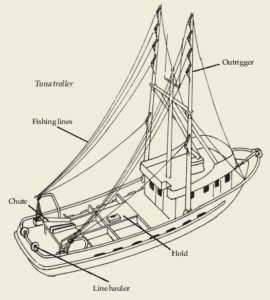 Environmental seafood guides produced by Audubon and the Monterey Bay Aquarium have cited the albacore troll fishery as an example of a clean fishery with little bycatch or impact on the envi-ronment. Albacore are very sensitive to water temperature, and few other fish off Oregon are found in those water temperatures, so the bycatch is low. It is important to know that Pacific "troll caught " Albacore come from a "sustainable" fishery. The fish are harvested using hook and line methods that result in little or no bycatch. No nets are used in this dolphin-free fishery that targets surface-feeding fish from abundant stocks.